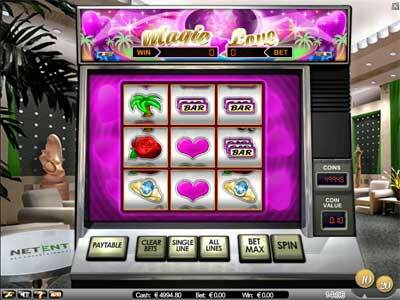 Magic Love is a nice 9 reel, 8 payline slot machine and it’s all about love. Symbols range from roses, to wedding rings to champagne with a car (and I guess, what they mean is the back-seat) as scatter symbol. Winnings disbursed are with reference to the symbols displayed on the screen once the wheel comes to a stop. Magic Love can be played with 10p to 20p per coin with up to 8 coins per payline. Be careful with your wager when you play for the first time: “Max Bet” will wager 8 coins on 8 paylines, immaterial of your coin size. This can be quite some money! The Maximum bet is 2000 coins. All in all, Magic Love is a nice slot with an interesting theme and a nice layout and sound. Try it, once you see it.